Burrs: Manufactured in Lichenstein, the 40 mm conical burrs grind coffee at 3.5g to 5.5 g/sec. depending on the setting. These burrs can do a very uniform grind, with a distinct lack of fines across its grinding range. These conical burrs are durable and will remain sharp for many years. The mechanism provides for precision burr alignment ensuring accurate grinding. Digital Control Panel: The front mounted control panel with backlit LED display is user friendly. 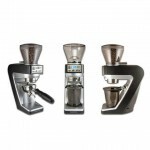 Three programmable buttons allow for grind time setting within 0.1 second. Simply press the start button and the Sette automatically delivers precise dosing. Grind Adjustment: The Sette has a macro adjust of 30 steps, grinding from espresso to manual brew. A stepless micro adjust with 9 indicators, allows the user to accurately dial in a perfect espresso. 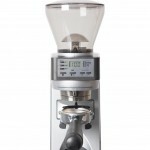 The macro/micro mechanism is directly connected to the cone burr resulting in immediate and true grind adjustment. Convertible Device Holder: A built-in convertible holder allows you to grind directly into your portafilter, the supplied grounds bin, or most of the popular brewing devices (Hario, Clever, Able Kone, AeroPress) – a standout feature amongst all other home grinders. The Sette’s grounds bin is made from an anti-static plastic, with a moulded spout for easy pouring into your preferred brewing device. The portaholder can accommodate any size of portafilter and includes an integrated hook for stability. 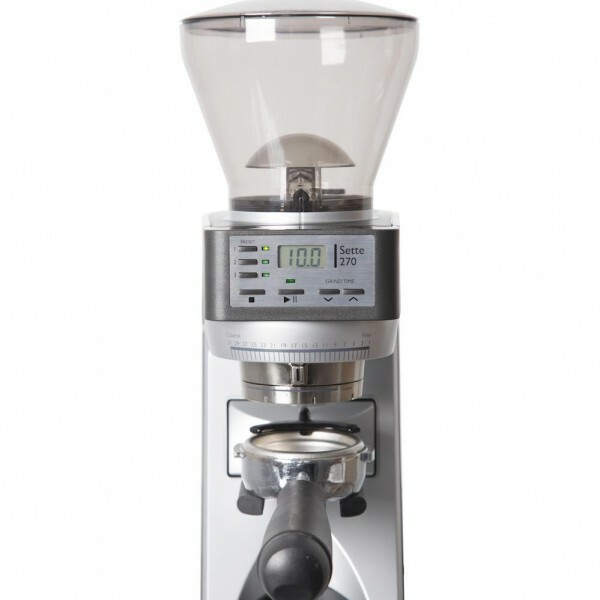 Hopper: The hopper holds approximately 275g of coffee. An innovative bean shutoff feature in the collar permits no-mess, no-fuss hopper removal for changing out beans. Minimal Retention: To maximize freshness, the Sette minimizes the ground coffee left in the grinder. 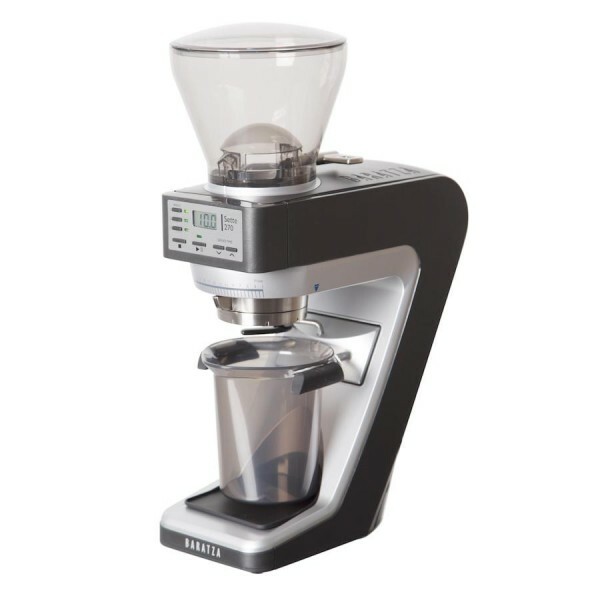 Brewing Methods: The Sette 270 is exceptional for all brewing methods, from espresso to manual brew. Motor: A powerful, high torque DC motor drives the Sette. The circuitry is equipped with an automatically resetting, thermal cutoff switch. Dimensions: The Sette Series is designed with a small footprint (like our other models) that fits under standard kitchen cabinets. Cleaning: The cone burr is easily removable with no tools, making cleaning very easy.